Whilst much of the work we carry out is confidential, below you will find some of our clients' opinions regarding Safety Devices products. "I am an experienced 4x4 driver and hold a 4x4 Instructor's Certificate, have been driving Land Rovers (civil and military) for 40+ years on 3 continents on all types of surfaces and in all conditions. I have been driving here in the Chilean Patagonia for 22 years. Up until the week before last I had never tested one of your roll cages, I now have, I am alive and I am very suitably impressed." 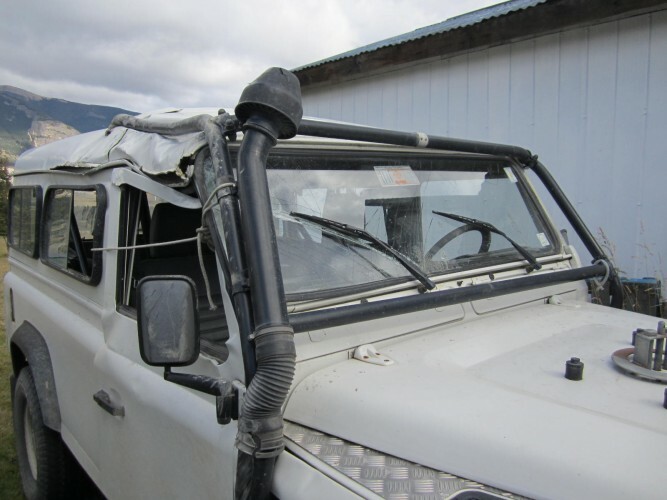 This quote from Graham Hornsey, the grateful owner of a Safety Devices roll cage L123, after his Land Rover Defender 110 Hard Top rolled on the Carretera Austral in the XI Region of Chile while towing an ex-military trailer. Over the years since the deployment of this peacekeeping mission, UNIKOM has experienced many accidents with its 4x4 vehicles, some with fatal consequences for the drivers. There are a number of reasons for accidents in our area of operation, not least, the difficult desert driving conditions encountered and the extreme climate of the region. Unfortunately, notwithstanding an ongoing defensive driving policy, accidents continue, some resulting in the complete write-off of the vehicle involved. As I indicated to A.D., Supervisor of the Technical Installation Team, when we met during this visit to the mission area, I am quite certain that were it not for your product being fitted in our vehicles, UNIKOM personnel would continue to sustain serious injury and would possibly have been killed. I have already expressed my gratitude to A.D. during his visit and would now like to place on record my sincere appreciation in the knowledge that our operational activities in the demilitarized zone are conducted more safely by having your roll-over protection system in our vehicles. After extensive research into Roll Over Protection Systems and suppliers around the world, Chuandongbei Gas Project in Sichuan China selected Safety Devices to design, manufacture and install bespoke external ROPS for our pipeline construction and patrol vehicles. The mountainous terrain with its tight twisting narrow roads in which this project is based, often have no guard rails and steep drop offs. This posed significant risk to our personnel traveling in the region and the installation of these safety systems has helped us mitigate that risk considerably. From first contact, through design to final installation, the team at Safety Devices have been a pleasure to deal with and we are confident that we have a cost effective, quality safety product protecting our people.